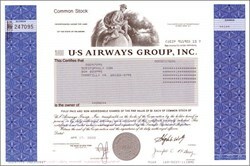 Beautifully engraved Certificate from the U.S. Airways Group, Inc. This historic document was printed by the American Banknote Company and has an ornate border around it with a vignette of Mercury sitting on the Earth with a futuristic airplane flying in the background. This item has the printed signatures of the company's officers including Stephen M. Wolf as Chairman. Stephen M. Wolf (born 1941) has been the director of Altria Group since 1993. He is also the Chairman of R.R. Donnelley & Sons Company in Chicago, Illinois, a Managing Partner at Alpilles LLC in Arlington, Virginia, and Chairman of the Lehman Brothers Private Equity Advisory Board. Wolf assumed his position as Chairman of R.R. Donnelley & Sons Company in March 2004. He assumed his position as Managing Partner of Alpilles LLC in April 2003. Wolf is also the Chairman of Lehman Brothers Private Equity Advisory Board. He is the retired Chairman of US Airways Group, Inc. and US Airways, Inc. Previously, from August 1994, he was senior advisor in the investment banking firm of Lazard Fr�res & Co. LLC. From 1987 to July 1994, Wolf served as Chairman and Chief Executive Officer of UAL Corporation and United Air Lines, Inc. He serves as a trustee of The Brookings Institution and the World Wildlife Fund. On August 11, 2002, US Airways Group announced that to complete its restructuring initiatives and obtain cost-savings from some of our aircraft lessors and financiers as a means of ensuring the Company's return to profitability, the Company and certain of its subsidiaries, including US Airways, PSA Airlines, Allegheny Airlines, Piedmont Airlines, MidAtlantic Airways, US Airways Sales and Leasing and Material Services Company, filed voluntary petitions for reorganization under Chapter 11 of the Bankruptcy Code. US Airways flies to 95 airports from hubs in Charlotte, North Carolina; Philadelphia; and Pittsburgh. Group subsidiaries Allegheny, Piedmont, and PSA and several independent partners operate a regional feeder network as US Airways Express. The group operates about 340 jets systemwide. US Airways Group is 25%-owned by investment firm Tiger Management. In 2001, US antitrust regulators blocked the group's pending acquisition by UAL, parent of United Airlines, and the deal was called off.